A church in Texas is being attacked for encouraging its members to make up their own minds regarding vaccines. Eagle Mountain International Church and the Kenneth Copeland Ministries has been attacked by the mainstream media this past week because 21 of its members were found to have measles. The mainstream media, heavily influenced by Big Pharma, wasted no time in seizing the opportunity to use this event as a means to promote the pro-vaccine dogma. The problem is that in order for them to do so, they had to twist the facts and actually lie. 1. This church is an “anti-vaccine” church. Let’s clear the air about all these “anti-vaccination” accusations. We do not have an “anti-vaccination” policy. In all our years of pastoring, we have never preached against vaccinations. We have never advised anyone against a vaccination. When receiving a vaccination, Kenneth Copeland says, “Pray over it with the same rules of faith and prayer that you use to pray over your food. Receive it with thanksgiving and sanctify it by the Word of God and prayer. Take advantage of what God has provided for you in Jesus’ Name.” For every creature of God is good, and nothing to be refused, if it be received with thanksgiving: For it is sanctified by the word of God and prayer. —1 Timothy 4:4-5. “I would encourage you to do that. There’s absolutely nothing wrong with doing that. Go do it. Go do it. Go do it. And go in faith,” said Pearsons. She also added, if “you’ve got this covered in your household by faith and it crosses your heart of faith then don’t go do it. The main thing is stay in faith no matter what you do.” The church also provided free clinics to whomever wanted the measles vaccinations. The church is telling its members that it is a personal decision, and that whatever decision they make, they should do so in faith. 2. The church leadership encourages its members to avoid vaccinations. FALSE. We have already shown the official position of the church above, which is to let members make up their own minds in this controversial issue. So why is the media lying about this point? But what Kenneth Copeland stated reflects how a great majority of American parents feel today, who are not anti-vaccine, but want to slow down the ever increasing number of vaccines recommended for infants. But doing so, or expressing such an idea to their family doctor, often results in ridicule from the medical professionals, or even worse, having your child forceably removed from your home by Child Protection Services . 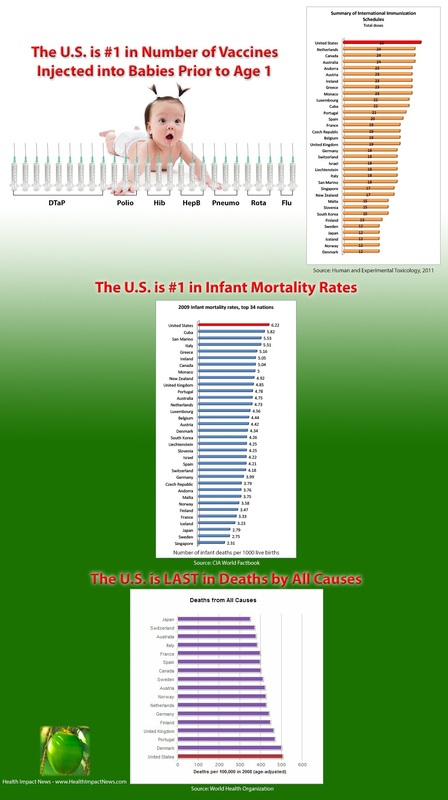 The United States has the highest number of vaccines required prior to age 1, and also the highest infant mortality rate among developed countries. Kenneth Copeland also expressed doubt about why the Hepatitis B vaccine is given to newborns, which is for a sexually transmitted disease. But he is not alone in skepticism, as many pediatricians are voicing the exact same concerns  today. In a Congressional hearing last year, many members of Congress also expressed outrage at the number of vaccines being given to infants today. 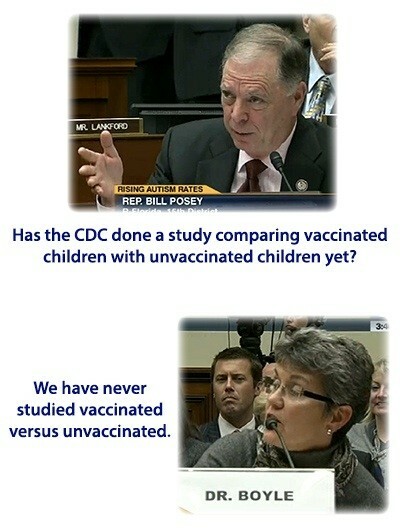 So why didn’t the media attack Congress for recommending that they should slow down the vaccine schedule? By using the same logic they are using against this church in Texas, they could just as well blame Congress and all pediatricians who have the exact same concerns. This has nothing to do with religion or faith. Click on the image to see video clips of the most recent Congressional hearing on the rising rates of autism. 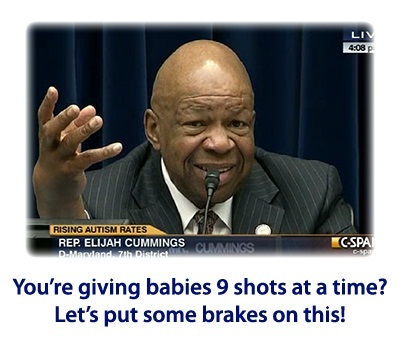 So why isn’t Rep. Cummings and other members of Congress being blamed for measles or chicken pox outbreaks around the country? 3. The measles outbreak are a result of its members not being vaccinated. FALSE. 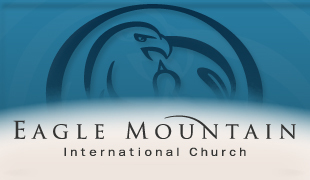 There are reportedly over 1,500 members of Eagle Mountain International Church, and there are no statistics as to how many are vaccinated and how many are not. The fact that some of the members who contracted measles were vaccinated clearly proves that both groups exist within the congregation membership. Just the fact that there were some who caught measles among the vaccinated members proves that the vaccine is not a guarantee against the disease, and it is just as likely the measles spread from the vaccinated population, as has clearly been demonstrated from previous outbreaks (see below). Given the church’s neutral stance on vaccines and that it is not part of their official teaching, one could safely assume that the ratio of vaccinated vs. unvaccinated members probably follows closely that in the general population. 4. Pockets of parents deciding not to vaccinate their children are why many childhood diseases are making a comeback. 5. Measles is a disease that was wiped out by vaccines and is now making a comeback due to the unvaccinated population. FALSE. This is a common lie promoted in the media whenever a measles outbreak occurs. They point to the ten years prior to the development of the vaccine, and attribute the vaccine to nearly wiping out measles. 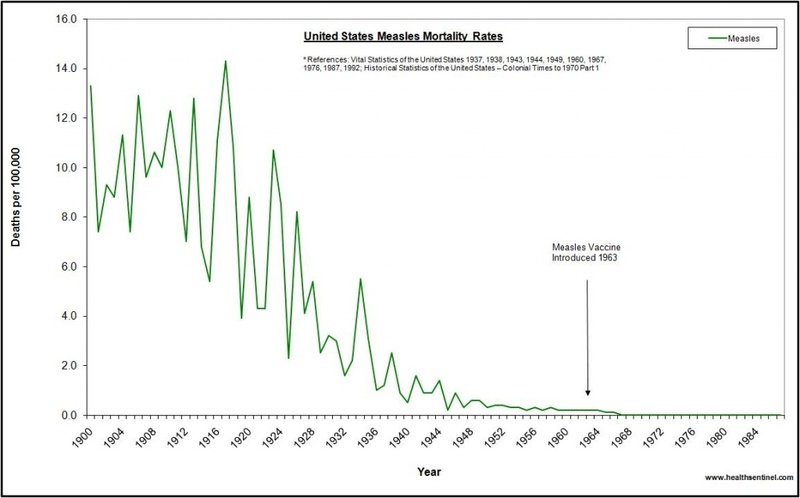 However, measles was already at an 18 year low when the vaccine was introduced, as the graph below illustrates. 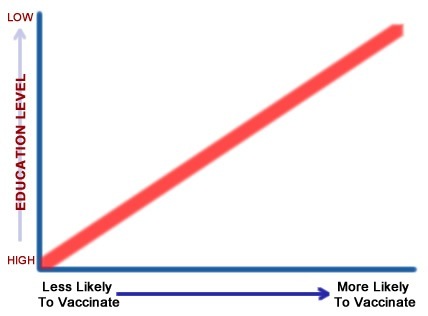 If you look at the 50+ years prior to the development of the vaccine, you will see that it is completely illogical to attribute low rates of measles to the vaccine. Image from healthsentinel.com  – Click image to enlarge. Dr. Viera Scheibner has written a very thorough review of the history of the measles vaccine: Outbreaks of Measles in Vaccinated Children Intensifying . She documents from peer-reviewed medical reports how cases of measles actually increased after the vaccine was developed, and that new strains of measles not previously seen have evolved. 6. The reason why parents won’t vaccinate their children is because of a fear of autism that was the result of Dr. Andrew Wakefield’s work which has been shown to be a fraud. FALSE. This is the straw man argument the mainstream Pro Pharma media has repeated so often now, that nobody even bothers to check the facts and see if it is true or not. It is not. Dr. Andrew Wakefield’s work among parents of children with autism showed a clear link to the MMR vaccine. But he was not the first one to discover and document this link, and it has been documented again, even after the attacks against him. See: New Published Study Verifies Andrew Wakefield’s Research on Autism – Again  – There is a list of 28 studies, past and present, that validate his work. After the British Medical Journal removed his study, they were forced to admit they had financial ties to manufacturer of the MMR vaccine. The other doctor in the study with Dr. Wakefield, who also had his medical license revoked, was completely exonerated . Dr. Wakefield is still involved in litigation to clear his name, but none of these facts are ever reported by the Pro Pharma mainstream media. You need to look them up yourself. Then there is the fact that the U.S. vaccine court, which was installed after Congress gave vaccine manufacturers complete legal immunity from the law, has awarded millions of dollars to children that the court has found as vaccine damaged with autism . An Italian court also ruled that the MMR vaccine caused autism , but the story was blacked out of the mainstream U.S. media. The Pro Pharma media continues to make sweeping generalized statements stating that there is no science behind the claim that vaccines cause autism. This is just not accurate at all. Courts around the world have awarded damages to families with vaccine-damaged children who have autism, and there are many studies linking vaccines to autism, as well as many doctors and nurses questioning the safety of giving so many vaccines to infants and young children (See: 150 Doctors and Scientists with Concerns About Vaccines Mainstream Media Never Interviews  and Veteran Nurses Not Buying Vaccine Myths ). A study  conducted by the CDC in 2011 found that 80% of parents surveyed were uncomfortable with vaccines. Could so many parents be wrong while the mainstream media is always right concerning vaccines? Conclusion: You have a right to know both sides of the vaccine debate, and churches are protected by law to freedom of speech and freedom of religion to express both views and let members make up their own minds. Don’t fall for the Pro Pharma mainstream media lies. The mainstream media is definitely pro-pharma, and the press releases and “news” stories are mostly written by medical professionals who are industry insiders. These stories are NOT the result of beat reporters truly investigating the truth. You will need to turn to the alternative media to find those types of stories. The vaccine issue is hardly a closed debate that has been settled by “science,” as the medical industry would like you to believe. Investigate BOTH sides of the issue before making any major medical decision, such as the decision to inject highly toxic materials into yourself or your child. The medical industry is NOT responsible for what happens to your child, as Congress has granted them total legal immunity, and the Supreme Court upheld this act in 2011. So if you or your child is injured by a vaccine, you cannot sue the pharmaceutical industry. Even though there is a specific vaccine court set up to handle vaccine damages, it is very difficult to litigate and receive compensation. As a result, a very small percentage of those damaged by vaccines are ever compensated. And with those who are compensated, research is never conducted to determine why they were injured by vaccines, and what can be done to make vaccines safer. The CDC, for example, refuses to conduct a true trial comparing vaccinated children with unvaccinated children to determine the harmful effects of vaccines. If you are relying on only what is published in the mainstream media regarding vaccines, you are only getting one side of the story, and they DO print lies. If you are a member of a faith-based organization, do you know, for example, that many vaccines are cultured from the cells of aborted babies (look it up yourselves)? The toxic ingredients of vaccines is not something the mainstream media is likely to report, so you need to research this information yourself. Every vaccine insert listing ingredients and side effects is available online. There still exists Constitutional protection to freedom of speech and freedom of religion, however, so this is not an issue churches should avoid! Healthcare has traditionally been a large part of religious organizations in this country, and leaders of churches and other religious organizations should not allow themselves to be bullied by the medical system and their spokespersons in the mainstream media. Educate your members on both sides of the vaccine debate and ALL medical issues, and do not allow stories with negative media coverage, like this one with the church in Texas, scare you into compliance with their agenda. Every vaccine, by law, has warnings about side effects, and you can look up the ingredients of any vaccine online. Unfortunately, vaccines are considered so routine these days, that you can get them at your neighborhood drug store as easily as buying candy. The warnings and side effects are seldom communicated, so you need to do this research yourself online. Every state allows vaccine exemptions, and the best place to get current legal information regarding your state’s vaccine laws is The National Vaccine Information Center . Consider supporting their work in disseminating vaccine information, as they are obviously vastly underfunded compared to the coffers of the pro-vaccine pharmaceutical industry.